Get certified and get the job! Network administrators are the unsung heroes of most every company in the world. In this day and age, it is absolutely vital to ensure that technology is running at its highest capabilities. The job of the network administrator is not only to fix problems with network infrastructure, but also to aim for prevention of such problems. With so much competition in the networking field, there are new network administrator certification areas coming available each year. In order to work in specific areas of network administration, it is necessary to obtain certification in that specific specialty. There are hundreds of network administrator certification areas, however there are some key ones that can get you in the door at most any big-brand company. The many angles that a network administrator must take to succeed at their job requires a certain set of skills. Not everyone is qualified to be a network administrator. Those who wish to enter into this field will need to take the necessary steps to get themselves acquainted with the proper skills to be successful. To comprehend the importance of certifications related to network administration, you must fully understand the many roles and responsibilities of those who have this title. With a clear understanding of what being a network administrator entails, you will be able to better align yourself with the proper qualifications. A CompTIA Security+ certification tells a prospective employer that you are capable of protecting valuable information. In a time when more business is being completed through Cloud and mobile transactions, having security measures in place is of the utmost importance. This certification will allow you to protect and secure a network. Each day, hackers aim to infiltrate networks to secure sensitive information. Without the skills and knowledge of both what to look for with security threats, as well as how to form solutions for possible security attacks, you will be left nearly unemployable. This certification is highly important to any network administrator career. Check out this information for a more detailed look into the process of obtaining this valuable certification. Most of the world’s IT infrastructure is powered by Linux. For this reason alone, a deep knowledge of this operating system is absolutely necessary to be able to work within most IT careers. The Android phone has made Linux a global power player in the service delivery and software industry. Think about any area of the network administration career path, and you are likely to run into a need for a Linux+ certification. The process is fairly straightforward, and CBT will have you prepared to earn this certification. Some of the largest organizations in the world rely on CompTIA Linux+. For this fact, there will be no shortage of careers with this certification. Cisco is the largest networking company in the entire world. Founded in 1984, it is one of the ‘veteran’ names in the world of networking that has stood the test of time. Many companies today have some form of Cisco interaction within their brand. This certification is a near necessity to earn an advanced position in the networking market. Cisco has 5 levels of certification, 2 of which are offered at CBT. Entry – The basics of network administration. The two certifications possible at this level are the CCENT and the CCT. This will start you on your way! Associate – This level is the foundation that your network administration certification rests on. This level includes nine different certification specialties for the CCNA (network installation) and the CCDA (network design). Cisco Systems Certifications have a variety of levels and skills. The Cisco name is synonymous with excellence in the world of networking. By earning any of these certifications, you give yourself instant credibility in the market. It is one of the most highly recommended IT certifications available. This certification really needs no introduction. The MCSA is a certification that will be applicable to almost any field, and will be a necessary certification to have in the tool kit. Specifically, this certification is pertinent to most any school district or corporation. Microsoft is the leader when it comes to networking technology. Regardless of your base network that you will be working within, Microsoft will have a dog in the fight in some facet. Some of the major areas within a MCSA revolve around the Windows operating system. With each new version of windows comes a variety of new learning possibilities and certification potential. For the best network administrators, the desire for continued learning in regards to the Windows operating system drives them to seek re-certification on a consistent basis. Another key component of the MCSA is the Cloud Platform. The cloud is one of the most endearing trends. This is all about knowing data and how to store it safely. A deep understanding of the intricacies of this program is crucial to being an effective network administrator. An MCSA will appeal to most any company you are seeking to be a network administrator with. Microsoft has a hold of the network technology market. For this reason, and MCSA will prove that you are updated within this competition, and are qualified to handle the newest technology within a network system. This certification is required for most any network administrator. It validates an entry-level knowledge of today’s important IT domains. Some of these include software and operating systems, network administration, information security, computer repair, cloud computing, and basic troubleshooting skills of each. Another valuable aspect to obtaining this certification is the training within customer communication and service. A big part of network administration is working with both employees and customers to ensure that the process is smooth and easy to understand. Good customer service is a must for any type of network administrator. Obtaining a CompTIA A+ Certification isn’t too difficult with perseverance, and the right attitude towards the IT certification program. This is the epitome of the rebar structure within the foundation of your IT knowledge. This certification proves that you are heading in the right direction. This is a step above the CompTIA A+ Certification. It is specific to networks in general, and is obtained after the A+ Certification is earned. This network administrator certification pledges that you have adequate knowledge of basic computer networks. This proves that you can troubleshoot, manage, maintain, install, and configure networks of a reasonable size. Many IT certification programs recognize the CompTIA Network+ Certification in their programs. These include the MCSA (as previously described), Cisco, and HP. Obtaining this certification opens the door for advancement within other powerful IT certification programs such as these. When you become Network+ certified, you take the first step into an advanced career in telecommunications and networking. Most universities and online programs offer intricate instruction to prepare for Network+ certification. For an aspiring network administrator, this certification is fundamental to future success, as well as career prospects in most any networking field. Where Do Network and Computer Systems Administrators Go to Get Certified? There are many avenues to consider taking in regards to obtaining your network administrator certification. 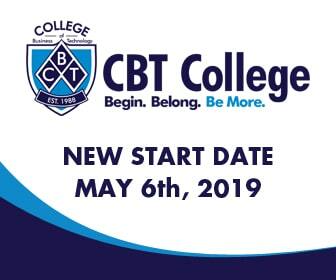 CBT College offers a variety of preparation methods and IT certification program material that will put you in position to earn certifications. It is important to understand that no network administration certification, or ANY field within IT, will be an easy road. Like any other career, it will require hard-work and dedication to earn the accolades. The College of Business and Technology takes great pride in putting individuals in the position to succeed. There are many other options that can be included on this list. With each passing year, there will be fields within networking that will fluctuate in demand. The College of Business and Technology has a hold of these trends, and can help advance your future by setting you up for network administrator certification in the most ‘in-demand’ areas. CBT will put you in position to succeed in all of these certification areas. IT is always changing and evolving, and our curriculum can adhere to these trends. Network administration can be a rewarding career. It is necessary to ensure that you have all of the necessary certifications in order to take the proper steps in your career path.